Sugar Slalom is a raw cow milk, natural rind cheese by Stan and Debora Bisini, cheesemakers. Mt. Mansfield Creamery is located four miles from the farm where the cows live. Stan transports their milk to the creamery on cheese making days. Debora milks the cows and ships extra milk to the St. Albans Cooperative. They make small batches of cheese only 8 to 12 times per month, increasing production according to demand. They milk registered Holstein and Brown Swiss cows who are on rotational grazing in the summer months and who are fed grain and hay during the winter. Mt. Mansfield Creamery started in June of 2009 and produces cheese year around. Debora milks about 30 cows per day and has received awards for the quality of milk she produces. Stan, a graduate of Paul Smith’s College, has put his chef days behind him to concentrate on their recipes for cheese. The cheese facility is in the heart of Morrisville, in the old United Farmers Creamery building. Stan and Debora renovated the building, and built their own cheese cave in the basement. They wash and brush the rinds to keep them thin to ensure that all the cheese is 100% edible! 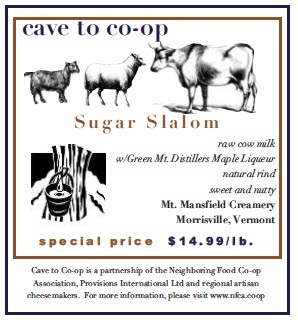 Sugar Slalom is an aged natural rind cheese, made with raw Vermont cow milk and Maple Liqueur, made at Green Mountain Distillers in Morristown, Vermont, which is added to the curd. The cheese is great on its own, but here are a few recipes that highlight its unique flavor. 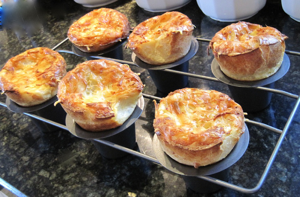 Place the popover pan in the oven and turn it on to 350 degrees, allowing both the pan and oven to preheat. In a medium saucepan warm the milk over low heat. Meanwhile, whisk the eggs with the maple syrup and then slowly whisk in the warm milk, a little at a time, making sure not to cook the eggs. Set aside. Next sift the flour and the salt together and slowly add this to your egg mixture. Combine gently until smooth. Remove your popover pan from the oven. Spray with a nonstick vegetable spray, or use butter or shortening to carefully grease the hot pan. Fill each popover cup about three-fourths of the way. Place about 3 tablespoons of cheese on the top of each popover. Bake for about 45 minutes in the 350-degree oven. When they are tall and golden, remove the pan from the oven and remove the popovers from the pan. Serve hot with butter.